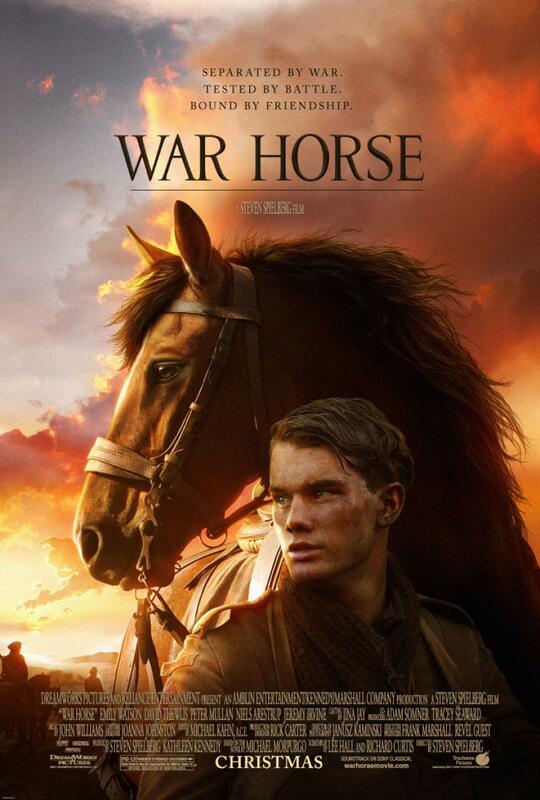 Directed by Steven Spielberg (‘Schindler’s List‘ (1993), ‘Saving Private Ryan‘ (1998)) and based on the novel by Michael Morpurgo, ‘War Horse’ is a moving picture about the strong ties of friendship which develop between a boy and his horse. The film begins with the boy’s father, Ted Narracott (Peter Mullan), buying a horse, Joey, at a horse market for a very high price. Young Albert (Jeremy Irvine) becomes instantly attached to the talented Joey and teaches him to plough to try to pay the family’s rent in Devon. When the war breaks out, however, Joey is sold to the army, but not before young Albert promises Joey to honour their friendship, and to find him someday. Although the film is full of sentimentality, it is also entertaining and heart-warming. Overall, this film is a moving, “feel-good” one, meant to “inspire” its audience, and boasting as its stellar cast such “big” British names as Benedict Cumberbatch (‘Tinker Tailor Soldier Spy‘ (2011)), Emily Watson (‘Gosford Park‘ (2001)) and David Thewlis (‘Harry Potter and the Prisoner of Azkaban‘ (2003)). Some scenes in ‘War Horse’ are brilliantly executed and visually stunning. One of the most memorable scenes is probably the one where Joye escapes from the battlefield: camera moves skillfully here showing the panic-stricken Joey as he makes his way through the war trenches with bullets flying by and grenades exploding all around him. Although there are many criticisms thrown at this picture, not all of them are just and fair. For example, although ‘War Horse’ is historically inaccurate at times, e.g., the languages used is inappropriate to the times shown, in defence it can be said that this film was never meant to be any historical documentary, but just an entertaining epic film. Also, because of the story depicted, i.e., the strong ties of friendship developing between a boy and his horse, ‘War Horse’, cannot help but be “sentimental”. It is viewed almost as a children’s film would be – with no explicit bloodshed shown. Although some critics also say that the film is too “old-fashioned”, it does manage to tell a story exceptionally well, and that is the most important thing. Another criticism may be that horses in the film are “(over)-humanised” in a fashion which comes close to ‘Beethoven’ (1992) or ‘Babe’ (1996). Although this is true and it is a pity, it is important to note that Spielberg’s movie is about a horse, and about a particular horse. The film follows Joey’s journey, and Joey is the main character. Therefore, it is important to portray Joey’s reactions and sentiments as he encounters different situations, telling the story from the point of view of a horse. Therefore, throughout the film, the emphasis is made on the events that matter to horses, for example, mass killings of horses. People, except maybe Albert, are coming and going from Joey’s life without making any big impact on it. This inevitably means that all the characters in the film are “underdeveloped” movie-wise, but there is also no real need to develop them in the first place. ‘War Horse’ is a family movie, making no claim to historic accuracy or realism. The only just and fair criticism of this picture is probably that it is too long. ‘War Horse’s running time is 146 minutes, and even if the audience forwards the movie every other fifteen minutes or so, the chances are that they will not miss anything important. There are also many instances in the movie where the plot becomes very predictable, and some scenes feel very “stagey”, and acting – very “artificial”. I like the first 1:15 minutes of the trailer. It has a lot of potential. I haven’t read the book it is based on, but I hope this film manages to do its own thing and come up with original imaginative concepts, because I see how it can feel like it just recycles many sci-fiction and recent CGI films made before it. Fair enough, and I also have faith in Spielberg. I still find “the BFG” and his other recent films a tad too “conservative” and safe plays both in their content and in execution. This is really not what the 21st century audience will be blown away by. Sometimes, it does feel like he is still shooting Hook, Jaws or E.T. I want to see him break new grounds, improvise and come up with something more thought-provoking. We see the rise of such directors as Nolan and Villeneuve, because the audience now just cannot get enough of something twisty with some inner beautiful design. Hopefully, Spielberg will follow suit – in its own unique way, of course. Very well said. The cultural change did happen. In some way, in music too. What do you think of his 2000s’ movies? I loved “Catch Me If You Can” best, and I cannot say much about the others. An eclectic mix in that period. I mean he is a very versatile director. Who would have thought that the same director was responsible for both Schindler’s List and the Indiana Jones series? Almost unbelievable. Still, I think adventure remains his forte. Do you have a theory/ideas about his career progression or have a favourite movie? Well, I have seen many but not all of his movies, including his debut feature film, ”Duel” (1971). It’s a very minimal movie but it is shot exactly in the same way as his other movies. It’s slick, with many quick cuts and entertaining. The main thing that I’ve always thought about him is that he is a great entertainer and that at times is his weak side actually… I love his adventure/sci-fi movie and thing they’re among the best of all time. But movies like ‘Saving Private Ryan’ and some other more serious stuff… While I did watch it many times and I consider it a great movie, I can’t accept that basically it was shot in the same way as his adventure movies. I mean the editing, the cuts, the pace, etc. It’s a tough war movie, but Spielberg can never get rid off his ”entertaining” style. And thanks to that, some scenes of the war that are incredibly hard, start to seem to easy, too simple to accept in some way. It is gorgeously shot, but the ‘entertaining’ part of that movie is too strong. It’s so polished. And that makes it a perfect movie for to be enjoyed by almost everybody. I remember seeing it for the first time when I was about 14 and it made a long-lasting impression on me. But now, 14 years later, I see it slightly differently. Remember ‘Full Metal Jacket’? It was entertaining as hell too, but when needed, it was heavy and just squeezed your brains and heart out with bloody silence. Yes, it has 18+ vs 14+ rating, but that’s not the point. It must be a pretty unpopular opinion and I didn’t use to think like that before, but after all these years of delving into very different kinds of cinema that’s what I think. So… I wish Spileberg wouldn’t apply the same style to his serious movies rather experiment more. He is very versatile, but I didn’t see him experimenting a lot. Trying new stuff and do very important things like telling crucial things about history in an easy understandable way – yes. But experimenting – not that much. And for any kind of artist I consider this to be very important. As for his adventure/sci/fi movies (including Catch Me If You Can) I think they are simply incredible. I just love them. That said, I haven’t seen ‘Empire of the Sun’. I agree with you that he does not experiment a lot, and that he tends to apply his “entertaining” style to his “serious” films. There are some very horrendous scenes in the “Schindler’s List”, but in all honestly – some of the time – I even find Benigni’s “Life is Beautiful” and Polanski’s “The Pianist” more horrific examples of the Holocaust depiction. Maybe it is yet again his downplaying of the seriousness? I have not seen “Empire of the Sun” either. His new film “The Papers” coming out soon, and I am sure it is again shot in his same old style which focuses on the traditional story-telling. I think it will be similar in execution to his “Bridge of Spies”. Yes, I think so too, you said it really well. That makes me wanna spend more time exploring others directors… and of his classical adventure/sci-fi movies which are your most/least fav? It is hard to say, and I will be biased. I was brought up on Hook and on E.T., which means I have seen them hundreds times over, and I have never been the Indiana Jones fanatic. Spielberg is also not the director which I will now look up to see great sci-fiction. I mean I really loved Close Encounters, but with his films what you find is that there are once-made-never-repeated-in-this-genre-masterpieces. I found Minority Report just about ok.
Hook…ha! I watched it a couple of times too as a kid, and E.T. surely more than dozen. I think you made a good point. Those were movies are great to grow up with. I love Indiana Jones too, although I must admit that while rewatching it in my 20s I calmed juuuust a little.